Emails exchanged between Concordia administrators in 2010 reveal a secret plan to short-circuit student activism on bottled water while negotiating the terms for renewing beverage company PepsiCo’s exclusivity agreement with the university. Administrators had informed students from Sustainable Concordia and TAPthirst, a group fighting against bottled water, that no such negotiations were occurring. The documents suggest the university was working to include a damage-control mechanism in the Pepsi deal to protect Concordia from student activism on the issue of bottled water. Those emails and the exclusivity agreement itself were obtained through an access to information request. According to Laura Beach from TAPthirst, Marc Gauthier, Concordia’s former executive director of finance and business operations and current treasurer, had agreed verbally in May 2010 that there would be no movement on the Pepsi deal until all parties had a chance to meet. In June, that verbal agreement was confirmed in writing in an email to Beach sent by Johanne De Cubellis of Hospitality Concordia. In August 2010, Concordia President Judith Woodsworth told The Link that she expected her VP Services, Michael Di Grappa, to work with students to introduce a bottled-water ban. In October 2010, Gauthier sent a series of emails to Di Grappa that mentioned the secret negotiations while expressing concern about student resolve on sustainable water policy. The “dual responsibility” clause was a damage-control measure in the event of a ban that administrators thought they still might be able to avoid. The problem was the “commitment” of students to such a ban. The plan to “educate” students was never put into action. The day before the meeting was scheduled to take place, students learned through an anonymous source that Pepsi and Concordia had already reached an agreement in principle, a stepping stone to a contract, and that the signing of a final agreement was only days away. Students showed up to the Oct. 27 meeting with Nestlé to stage a sit-in protest. Despite the protest, Di Grappa went ahead and signed the final agreement on Oct. 29, 2010, his last day in office before taking up a position at McGill as VP Administration and Finance. It seems Concordia had hoped that students, faced with the fait accompli of a renewed exclusivity agreement, would abandon the cause of a bottled-water ban. If that was the university’s objective, then things did not go at all as planned. Concordia’s unilateral move lit the fuse on a student activist bomb. 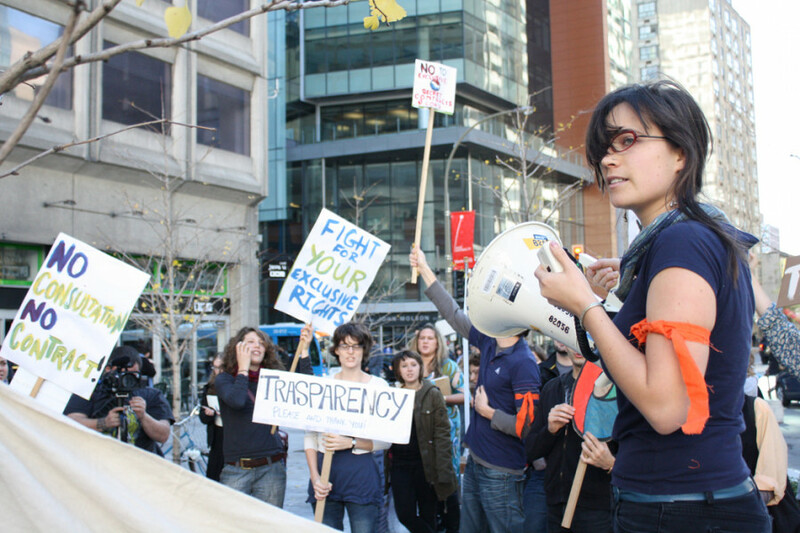 Sit-ins and legal letters preceded protests and petitions, culminating in a March 2011 referendum organized by the Concordia Student Union that saw students voting in favour of banning bottled water from being sold on campus. In April 2011, soon after the student referendum, university administrators changed tactics, announcing a gradual move away from selling bottled water and towards improving public water fountains. The moves would be made in concert with Concordia’s corporate partner, Pepsi. Today, there is no bottled water for sale in any vending machines on Concordia’s campus. Does this mean the student activists won? Beach agreed that the move towards free water and away from plastic waste is a positive one, but she noted that the issue of bottled water has overshadowed a much wider student agenda. From this perspective, the university’s unilateral signing of the Pepsi exclusivity deal behind students’ backs effectively shut down any chance for the kind of broader change envisioned by student activists. The contract’s “dual responsibility” clause splitting the cost of a bottled water ban between Concordia and Pepsi allowed Concordia to avoid the worst consequences of giving in to student demands in one particular area while maintaining its overall corporate partnership with the beverage company. But Schmidt is well aware of “the university’s history of being less than truthful with students when the interests of students are in opposition to the interests of large corporations.” He sees an important role for student mobilization in countering the administration’s pro-corporate bias. “Students have been pushing for changes to the RFP [Request for Proposals–a document that sets out the basic requirements expected from a potential food services supplier] and are facilitating the possibility of social-economy organizations bidding against Chartwells,” Schmidt continued. Gauthier did not respond to a request for an interview and Di Grappa referred all inquiries to Concordia spokesperson Chris Mota. Mota refused to talk about Concordia’s secret dealings with Pepsi in 2010. “I am not going to talk about what happened in the past,” she said. When asked how Concordia was working to win back the trust of students, Mota said that she was not aware of any trust issues and that students have been participating in the current RFP drafting process for food services. “The university established a working group to get student input in the RFP and everybody has been working together in good faith,” Mota said, adding that she expects the RFP to be released before the end of 2014 so that new food and beverage supply agreements can be in place by May 2015, when the current agreements are set to expire. The Pepsi agreement is also set to expire in 2015, but the RFP drafting process for the beverage contract is not as advanced. In 2010, the issue was bottled water. In 2015, the issue could be sugar. In the wake of the medical community’s successes in fighting Big Tobacco as a contributor to lung and heart disease, there is now a call for action against Big Soda as a leading culprit in today’s obesity and diabetes epidemics. Dr. Jeff Ritterman, vice-president of the board of directors of the San Francisco Bay Area chapter of Physicians for Social Responsibility, has been supporting ballot measures to tax sugary drinks. He said Concordia students should reject another deal with any soft drink corporation. Dr. David Bernans (PhD) is a former president of the Concordia Graduate Student Association (2005-2006). He is a Quebec-based writer and translator.